Gently drift off to sleep or share a special moment with your sweetheart in a POLYWOOD® bench, swing, or glider. 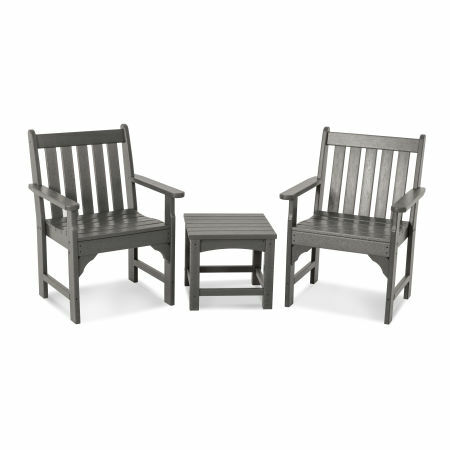 Realize your vision with outdoor furniture constructed from durable, weather-resistant lumber. Share a peaceful moment with your sweetheart or gently rock your child to sleep in a POLYWOOD® outdoor swing, glider, or bench. Built for two or three, outdoor benches, swings, and gliders provide the perfect setting for bonding over drinks or reading the morning paper. Complement the existing aesthetic of your outdoor space while opening up new possibilities with a swing, bench, or glider from POLYWOOD®. Transform any space into a relaxing haven — swings are the perfect addition to your front porch, contoured for great comfort and providing that signature soothing motion so you can unwind after a long day. Benches add practicality and a sense of welcome to any garden or park space, while gliders allow you to gently rock back and forth without the need for installation. Throw in a side or conversation table to create the perfect reading escape or retreat among the trees. POLYWOOD benches, swings, and gliders are available in a variety of design styles and lumber colors in order to match your exact vision. POLYWOOD® gliders, benches, and swings are engineered for your comfort, taking inspiration from classic Adirondack designs, traditional garden benches, and an ingenuity that combines fashion and function effortlessly. Choose benches, swings, and gliders from our most popular collections, including Vineyard, Chippendale, Adirondack, Nautical, and Rockford. Our durable HDPE lumber elevates the craftsmanship of our benches, gliders, and swings, allowing them to be exposed to the wind, rain, and elements for years without degrading, rotting, peeling, or cracking. The unique POLYWOOD® Color-Stay Technology ensures that the vibrant hues or earth tones you choose for your benches and swings don’t fade or split in the sun. After installation our swings, benches, and gliders are a breeze to clean. The low-maintenance material only requires an occasional surface clean with a damp cloth and gentle soap in order to remove dirt and grime. You can choose to undergo a deep cleaning once a year to keep your outdoor furniture looking like new, maintaining a pristine outdoor seating area season after season. Curl up next to your loved one under the canopy of your favorite tree or a thicket of vines, reading a book and marveling at your handiwork from the comfort of a POLYWOOD® bench. The dependable lumber is a great match for the natural environment that could quickly rot or degrade wooden benches. Sit with your spouse snacking on breakfast pastries and fruit as the morning sun breaks over the lake at your favorite weekend getaway. Add a Sunbrella® cushion so you can remain cozy and take in the view long after the sunrise. A POLYWOOD® swing on your front porch lays the perfect foundation for weekly grandkid time - pick their favorite picture book and dive into a world of adventure without leaving the comfort of your gentle swing. Can’t make the final choice between a swing or a glider? Not sure what size bench will accommodate three people? We’ve demystified the buying process so you can settle on the ideal combination of POLYWOOD® benches, swings, and gliders for any outdoor space. Read our extensive buying guide to have all your questions answered.